Stations: Warrants & Summons at Eastwood, Civilian Police Contingent – Cyprus – part of Australia’s 8th Contingent deployed in 1971. 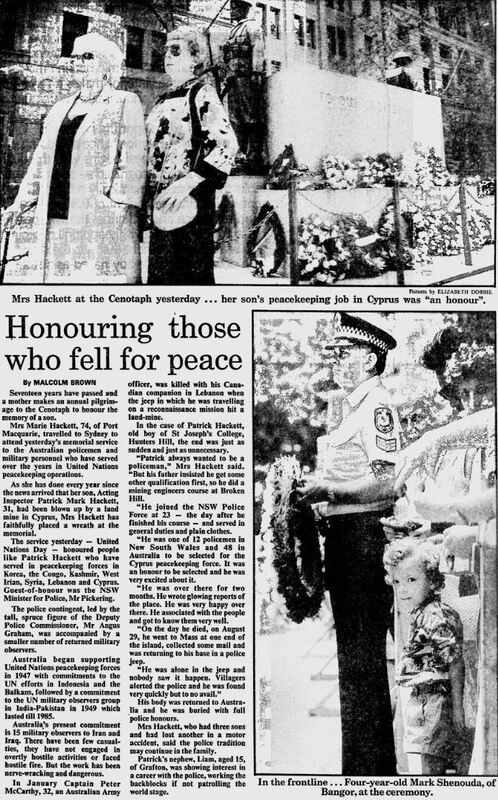 Constable Hackett was killed in Cyprus while on special duty in that country with the United Nations Civilian Police Force (UNCIVPOL). On the 29 August, 1971 he had driven to Episkopi and Paphos before setting out to return to Polis. Whilst negotiating a number of very sharp and dangerous hairpin bends, his vehicle left the roadway, crashed down an escarpment and overturned several times. Constable Hackett was killed instantly. The constable was born in 1940 and joined the New South Wales Police Force on 25 February, 1963. At the time of his death he was attached to the Civilian Police Contingent in Cyprus. 17 June 2017 – Malaysia Memorial in Cyprus taken today as Australian Police complete the long mission and are leaving Cyprus. 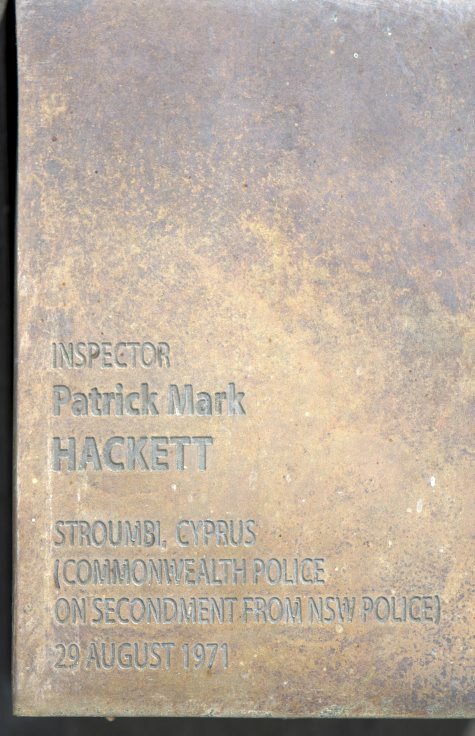 Patrick Hackett was a member of the NSW Police Force. He commenced as a Trainee in 1963 and was confirmed as a first class constable in 1968. 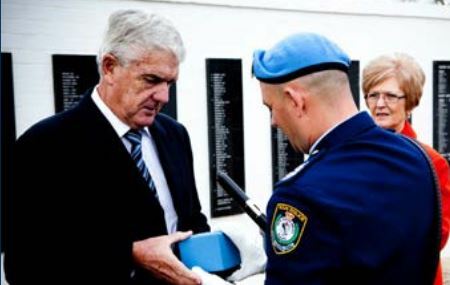 Patrick was sworn in as a Special Commonwealth Police Officer at the rank of inspector when he was selected to be part of Australia’s Eighth Contingent to Cyprus. The contingent, part of the United Nations Peacekeeping Mission to Cyprus, was deployed to Cyprus in 1971. Inspector Hackett was tragically killed in a car accident near Stroumbi when his vehicle left the road on a sharp corner. He was posthumously awarded the Police Overseas Service Medal with Cyprus clasp, the United Nations Service Medal and the Dag Hammarskjöld Medal. Canberra: An Australian policeman serving in Cyprus has been killed in a traffic accident. 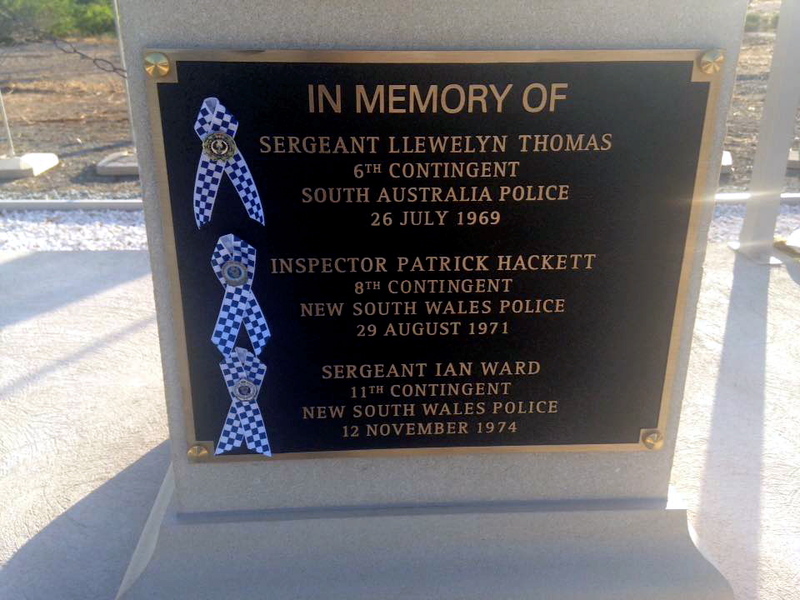 He was Constable Patrick Mark Hackett, of the NSW Police force. 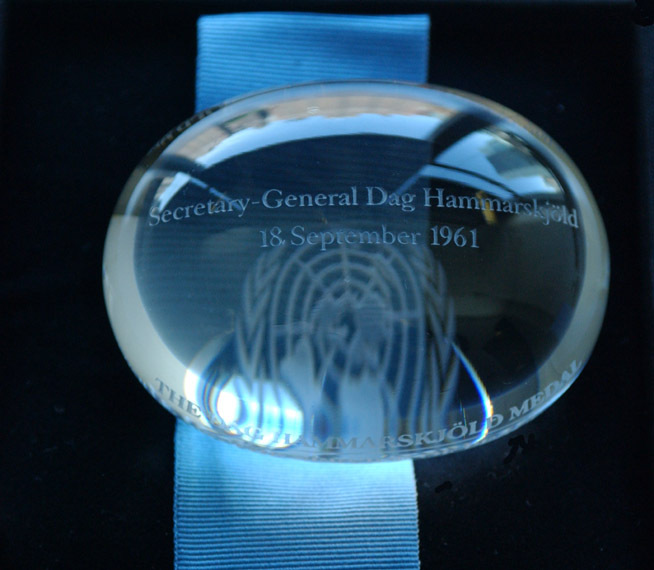 In 1997 the Dags Hammarskjold Medal is established by the United Nations to honour those who lost their lives whilst on a UN peacekeeping mission. The family of Inspector Patrick Hackett receives the Dags Hammarskjold Medal in 2010 from Sergeant Mark Elms, NSW Police Academy. On 13th August, 1971, Senior Constable William Edward King, who was then the officer-in-charge of police, East Gresford, was shot dead at East Gresford Police Station by a man who fired upon him with a rifle. 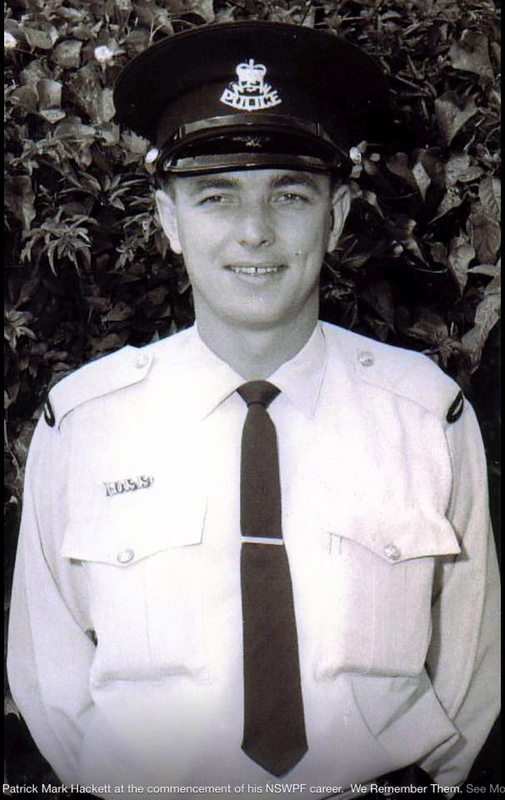 On 29th August, 1971, Constable 1st Class Patrick Mark Hackett died from injuries received in a motor accident at Polis, Cyprus, whilst performing duty with the New South Wales Police component of the Australian Police Contingent of the United Nations Peace Keeping Force. On 30th September, 1971, Sergeant Second Class William Watson Riley and Senior Constable Maurice Raymond McDiarmid, both then attached to Blacktown Police Station, were shot dead in a house at Toongabbie which they had entered to arrest a man who a short time before had murdered his brother and raped a woman in the same house. A police funeral with full ceremonial honours was accorded these deceased officers at which appropriate tributes were paid. In recognition of their outstanding courage Sergeant Riley and Senior Constable McDiarmid were posthumously promoted by me to Sergeant 1st Class and Sergeant 3rd Class respectively. In addition, I submitted recommendations to the Premier for favour of consideration of Royal Awards being granted in both cases. To assist the widows of the deceased police the Premier approved the payment to each of them of the sum of $12,500 as a gratuity. This payment did not in any way affect their entitlements to payments under the provisions of the Police Regulation (Superannuation) Act.